Our Stock consists mainly of Glass in thicknesses from 2mm – 10mm, Mirror in 4mm and 6mm, we also stock Wired Safety Glass both Clear and Obscure and Laminate Safety Glass, ceramic glass for wood burners, and 4mm and 6mm polycarbonate the more robust thicker glass and toughened glass we have to order in, this takes approximately 3-5 working days. We have a large stock of horticultural glass in ready cut sizes together with clips and fasteners. 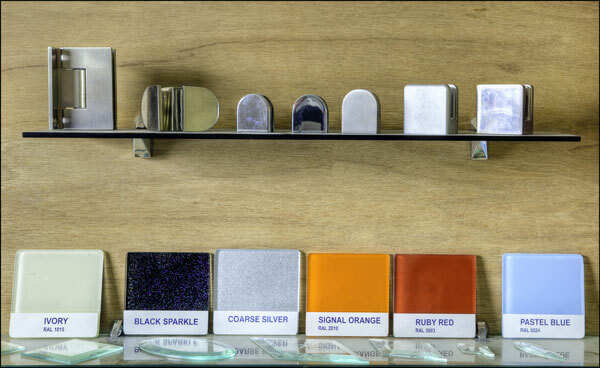 We have in our showroom a display of clamps and fasteners used in the assembly of glass balustrades and staircases, we also have samples of glass bevels and coloured glass splash backs.